Do you have international travelers on your holiday list but you’re not sure what to give them? We’ve got two holiday gift ideas that are perfect for travelers. And you don’t have to stand in a long line – a simple phone call is all it takes! Or go online at your convenience to order. Until December 31st, we are offering our Pocket Wi-Fi Hotspot for a reduced price of $139.99 (regular price is159.99). They will enjoy a secure and reliable access to the Internet for their emails, social media, data streaming and Wi-Fi calling, plus they can connect up to five devices at one time. Recently, Fox News did a segment on Avoiding Scams During Holiday Travels and interviewed Mark Murphy of Mark Murphy Travels. He recommended our Wi-Fi Hotspot as the perfect device to avoid Wi-Fi scams and ensure safe and secure connections while traveling. And with our reduced price, it is the perfect gift for your traveling friends and family! Travelers have told us they love being able to connect from just about anywhere they are — from train rides through France, bike rides in Italy, or at a conference in South Africa. Gift your traveler with the gift of free time with our Wi-Fi Calling App Gift Cards. Call our customer support and they will load a gift card with the amount you would like. Ten dollars gives your traveler a little over eight hours in free calling to the U.S. (at 2¢ per minute). Once they download the app on their smart phone (free from iTunes or Google Play), they simply enter their account using the gift card. If you also download the app on your smartphone, you can enjoy free unlimited app to app calling. Travelers who have used the Wi-Fi Calling App love its crystal clear calling and reliability — no matter where they are traveling. 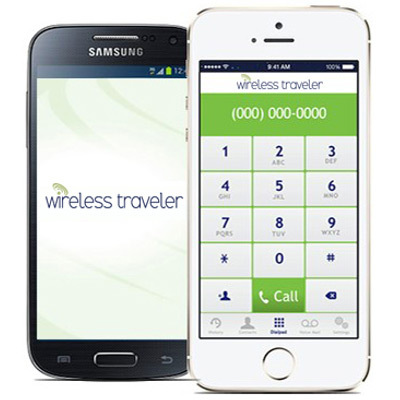 If you are interested in ordering either the Pocket Wi-Fi Hotspot or purchasing a gift card for the Wi-Fi Calling App, please call our customer support at 1-866-700-3883 or email them at support@wirelesstraveler.com.